I think so, Mary Beth. Whatever it takes to motivate people to plan ahead for emergencies that are bound to happen. Thanks! I had not thought about snowstorms/blizzards being as much a severe weather emergency (being snowbound and without power) as tornadoes and hurricanes, Susan. Now that you remind me, that definitely needs to be a consideration of anyone living in northern places where winter storms are prevalent. I'm now remembering several storms just last winter here in the U.S. where storms caused power outages for several days each! 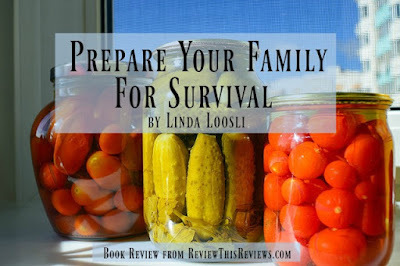 Your review of Linda Loosli's survival book sounds perfect what with charts and lists and excellent suggestions to be prepared for any situation. And today is the perfect day to publish your review as June 1 begins the hurricane season! Great point about hurricane season, Elf. Thanks for mentioning that! The most serious, wide-spread outages we've had here in the mid-south have been from ice storms with the worst being about 15 years ago. Over time, I think we've forgotten how uncomfortable it was to get along during those outages and, therefore, we've become complacent about maintaining emergency supplies. It's good to learn from others and get ourselves re-motivated to keep those emergency preps up to date. To me, that's definitely a good reason for reading the book. Appreciate your thoughtful comment! It sounds like a great book to have on hand Susan! And, one that needs to be read well in advance of actually requiring the information within. I remember one ice storm several years back. We were without power for a few days. I did what any reasonable thinking person would do that was not prepared for the emergency. I went to Mom & Dad's house! Good thing they have always been prepared for whatever happens. And, I wasn't alone. We all piled up in their house like a bed of snakes prepared to strike if anyone opened the door and let in a cold blast. I do think my parent's generation are naturally better prepared for emergencies simply due to the experiences of their own childhood. After all, everything didn't just happen with the flip of a switch for them. Now, we must be taught what we never learned that would have been basic, practical knowledge before we were born. Cynthia, another great point about the "older generation" and the wise habits that many of them learned as second nature when they were growing up. Unfortunately, I think there may be many more who have no clue what they could be up against in case of a long-term outage. I'm happy to see more people growing and canning food and becoming more self-sufficient these days, for whatever reason. Great thoughts - thanks! It never ever hurts to be prepared. I like this idea and maybe it would even make a great wedding present for the couples that have everything else they ever wanted. I think my son and his bride to be would probably think it was a great idea. After all, all parents want their children to be safe at all times. Grammie O, I love the idea of giving the book as a gift, and especially to younger family members. Excellent idea! You're right, it never hurts to be prepared. Thanks so much! 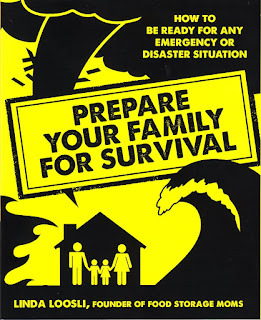 With the climate change we (in the north) are used to snow/blizzards, then this year we had our first hurricane windstorm - out for 7 days no electricity - I'd be interested to read the bugging out section - one can never be too prepared anymore! Wow, Savvy, seven days with no electricity is a very long week! Reading your comment, I have to wonder if those of us in milder climates are less prepared because, in general, we have fewer threats from weather. Something for me to think about... The bugging out section gives excellent advice. There's a helpful discussion about legal papers and making a grab-and-go binder that everyone should read. I think you'd enjoy it. Excellent review. I'm not so much into the doomsday thinking...but I clearly remember the blizzard of '78 and we were stranded for so long. Fortunately, we lived on a small farm and had plenty of food stored. But those feelings of "what if..." has stuck with me all these years. This is an excellent review of a book covering an important topic. Dawn Rae, thank you for those kind words. It seems that many of us have blizzards, ice storms, floods, or hurricanes in our past that caused shutdowns that we will always remember. No reason to think similar incidents won't happen again. Being prepared for survival is like having insurance. You hope you'll never need it, but when you do need it, you're really glad you payed those premiums. I appreciate your input! The book is a great road map for preparing, Barbara. I know that sometimes I need to be taken by the hand and told what to do (kindly, of course) and this book accomplishes that. I hope you find it useful! I think we need some help thinking these issues through during this age we live in. We also need to get better prepared. Great summary of the emergency prep situation, Barbara. It really does help to have help thinking things through. Thanks!